How many of us take the time to explore our “own back yard”, whether that be your own country, state or county or even the town or city you live in? A staycation can be the perfect get away and something I’m trying to do more often. Next in my staycation series we’re taking a trip to the North of England with Rachael to a place high on my UK travel list – Northumberland. Rachael is a lifestyle blogger living in the North East of England with her husband. She’s a born and bred proud Geordie. She writes about a little bit of everything from makeup and beauty, food reviews, how to tips and more. An NCTJ trained journalist who has spent the last three years working her way up the communications and PR ladder. She’s training for her first half marathon and working through a 30 things to do before she’s 30 bucket list. A guest post by Rachael Stray. Northumberland has so much to offer from golden beaches, dramatic hills, lush wide-open spaces and a turbulent historic past to explore. If you love the feel of golden sand beneath you toes and that salty sea air filling your nostrils then a visit to Northumberland’s magnificent coastline should certainly satisfy you. There’s more than 30 miles of beaches along the spectacular Northumberland Coast. There’s retro-chic seaside towns such as Seahouses where you can promenade along the pier, play at the penny arcades and tuck into the obligatory fish and chips. 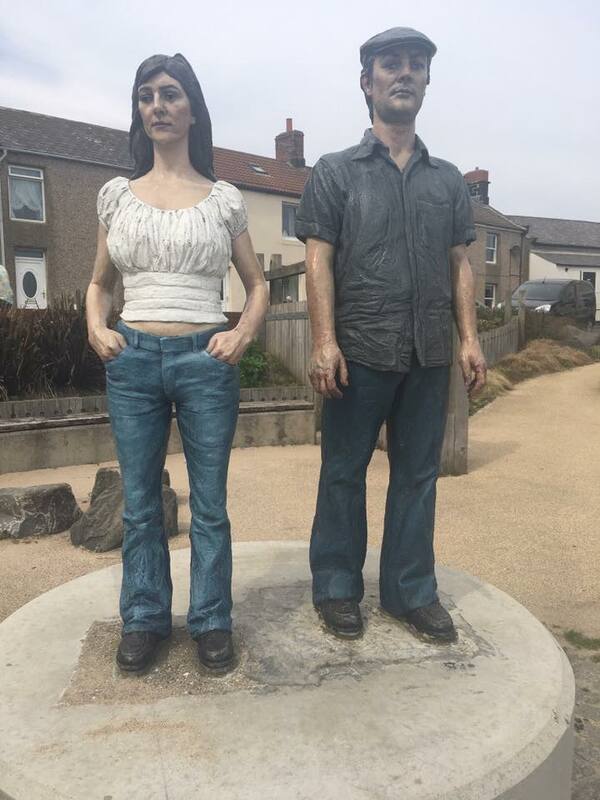 Newbiggin-by-the-Sea is home to Britain’s first permanent coastal sculpture The Couples as well as some good fish and chips! Bamburgh beach is my favourite though – it’s steeped in history and there’s loads to do in the village. Of course you can pay a visit to the castle but there’s also impressive stretches of pure golden sandy beaches, a variety of proper English tea rooms and restaurants, St Aidan’s Church and a newly renovated museum dedicated to Grace Darling and lots more! Did you know Northumberland has more castle sites than any other county in the whole of England – 70 in fact! Warkworth, Dunstanburgh, Bamburgh and Lindisfarne castles all stand guard along the dramatic coast. Bamburgh Castle and Alnwick are probably the two most well-known. Alnwick Castle is perfect for Harry Potter fans! Bamburgh Castle is so impressive and well worth a visit. There’s also Chillingham Castle reputedly one of the most haunted castle in England as well as the award-winning and stunning Langley Castle Hotel. Walkers really are spoilt for choice when it comes to Northumberland whether its long distance routes with cosy pubs or a more leisurely curricular walk to take in pretty hamlets and soak up the rich wildlife along the coast and countryside. You can do the 84-mile signposted trail which stretches from coast-to-coast or there are many circular walks which take in some of the most scenic areas around the famous Wall. I recommend heading north of Bamburgh Castle where the coast is a little wilder –you have the sea on one side and sand dunes on the other and in the horizon you can see Lindisfarne Castle. It’s been a long time since I did this walk but it’s varied in terrain and exciting. This cross-border route links Melrose Abbey in the Scottish Borders, and the Holy Island of Lindisfarne. The route has everything from the rugged terrain of the Cheviot Hills, to the enormous sandy beaches of the Northumberland coast. You’ll see ancient castles, churches and abbeys, as well as charming villages and an array of wildlife along the way. For wildlife lovers I would recommend a visit to one of Northumberland’s amazing coastal nature reserves like the Farne Islands, Coquet Island and Druridge Bay. Northumberland is home to two areas of outstanding natural beauty – the North Penines and Northumberland National Park. The Northhumberland Wildlife Trust runs a range of family-friendly wildlife activities during the summer months including mini-beast trails rock pooling and otter walks. Northumberland is also home to Europe’s largest area of protected night sky – Northumberland International Dark Sky Park so for any star gazers I would recommend bringing your telescopes for a right treat (weather dependent of course)! When my husband and I had our glamping trip in Northumberland National Park earlier this year we were amazed at how much we could see. Cool! Now I want to visit! I love castles! And it sounds like there are amazing walks to explore. Thanks for introducing us to your corner of the world! Thanks for your comment. The UK is full of wonderful places to visit and I’m looking forward to seeing more of Northumberland myself. I live in Newcastle and love Northumberland so much, so many of my favourite places there. It’s just so beautiful! I would like to see Northumberland. I also like to see all the castles, visit the beach, go along the coastal path and walk some of the wall path national trail. Thanks for your comment Debs. One of my travel goals is to walk the Hadrian’s Wall trail.